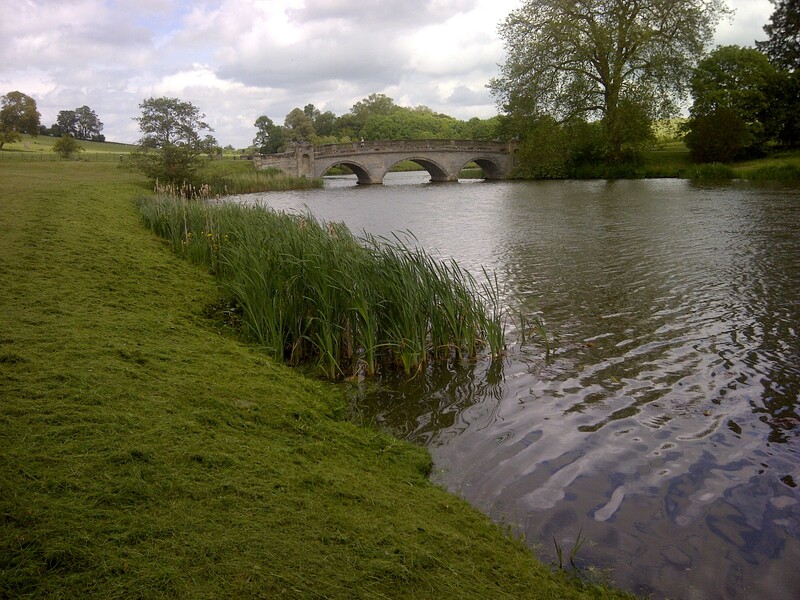 This entry was posted in Grounds Team updates and tagged #cvgrounds, Compton Verney Landscape and Gardens, Parkland, Wildlife Haven on January 14, 2014 by Grounds Team. Flora, a June Selection from Compton Verney. A small selection of flower images of plants to be found in the first half of June 2013 around the Landscape and Gardens of Compton Verney. 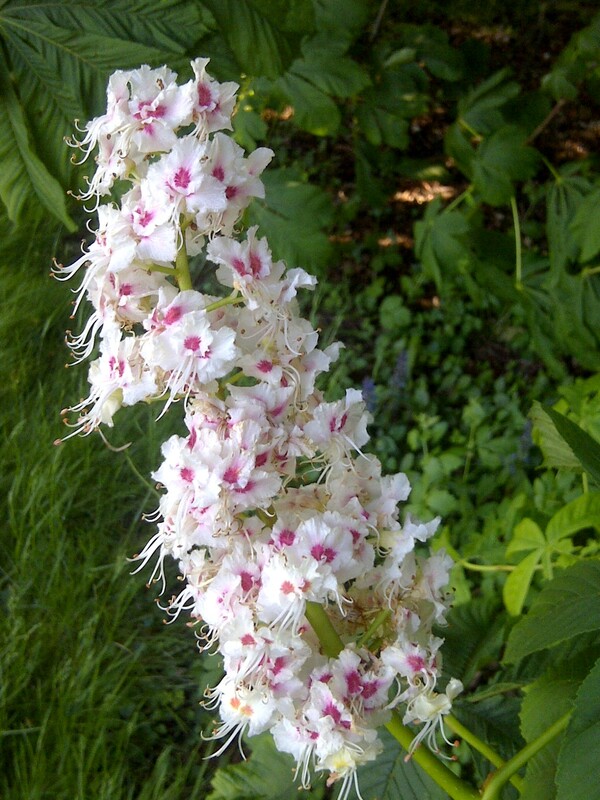 Flower panicle of Aesculus hippocastanum, or Horse Chestnut at Compton Verney. This entry was posted in Grounds - Flora and fauna and tagged Blue Bugle, Borage, Catmint, Chives, Compton Verney Landscape and Gardens, Geranium, Herb Robert, Horse Chestnut, Lily-of-the-valley, Maythorn, Oxeye Daisy, Persian Lilac, Red Campion, Red Valerian, Yellow Flag on June 16, 2013 by Grounds Team. Interested in gardens, art, plants or landscape history? Or are you planning a visit to view Compton Verney’s stunning collections and exhibitions? You may be interested to hear that whilst on site, you can join me, head of landscape and gardens for a one hour tour of the grounds where I’ll talk about all of the above and more. We shall be walking around the lawns and through the restored path network of the wooded ice house coppice, where I shall describe and point out the key historical development of the grounds, lost and restored features, and of course our valuable plants and wildlife. The grounds tour is a great opportunity to see another, very different side to this magnificent arts venue. Tours are on the first Thursday of each month, at 1:30pm, and are available free to members or for visitors who purchase a collection and grounds ticket – please sign up at ticket desk on arrival. Do come along and show your support for the grounds. I very much look forward to seeing you on the next tour! For more information – please Click Here! 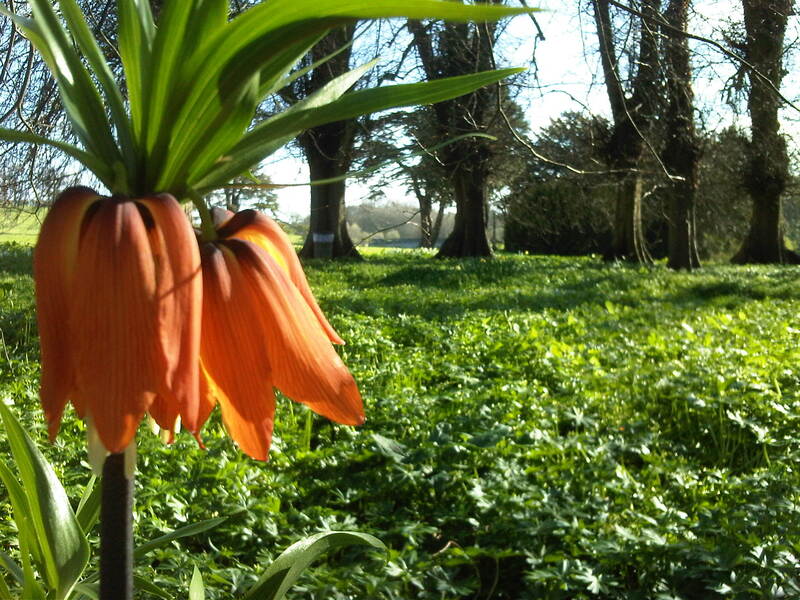 This entry was posted in Events and family activities, Grounds Team updates and tagged #cvgrounds, Compton Verney, Compton Verney Landscape and Gardens, Grounds Tour, Ice House Coppice on May 1, 2013 by Grounds Team. We were greeted this particular Monday morning by nice sunny weather at Compton Verney. However, whilst it would have been a great day for grass maintenance, the grounds team were booked in for an away day to our nearby neighbours – the National Trust site of Charlecote Park. It would be very easy to slip into the historical links between Compton Verney and Charlecote, especially the Capability Brown connection, but for this post I shall stay with the reason for the invite; which was for a day’s testing of ‘Green’ garden machinery. A range of property teams from across the region had been invited to a trial day which had been arranged in association with Sally Drury on behalf of Horticulture Week magazine – the industry standard magazine for garden and grounds maintenance professionals. 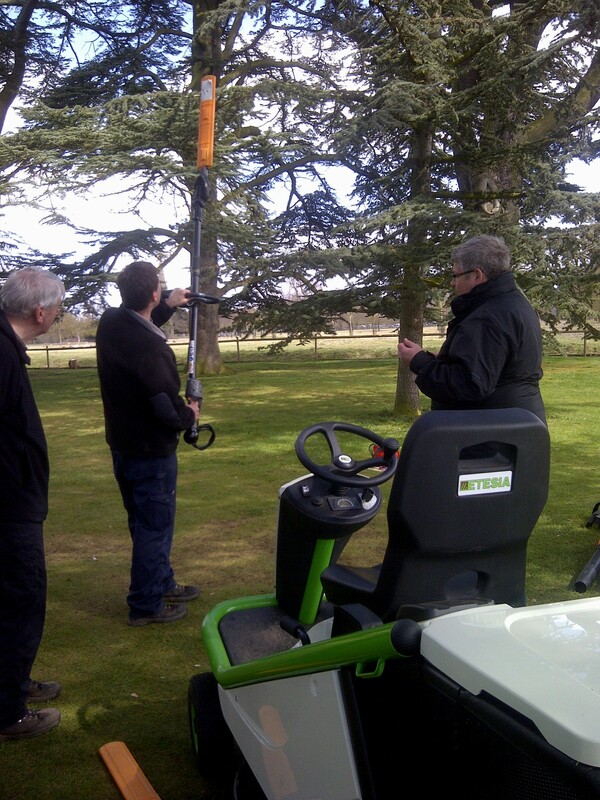 Horticulture Week Machinery Trial at Charlecote Park. The key reason for the day was to put a number of manufacturers machines together in one location, to compare and obtain feedback from a range of operators – a kind of Top Gear special for gardeners but without the attitude! ‘Green’ machines refreshingly were the central focus, battery powered items were therefore the order of the day. 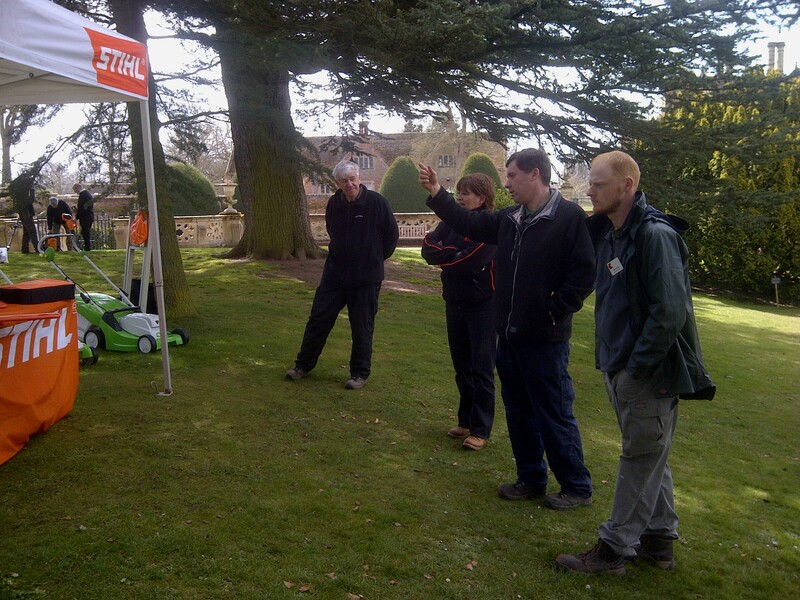 We’ve a small but effective range of petrol/diesel fuelled machines at Compton Verney, and with our new ‘Green’ working agenda this year – we were very much looking forward to putting some of these trendy machines through their paces. Whilst battery power for DIY and professional tooling has been available for many years, only recently has it jumped the divide to garden machinery, including strimmers, brushcutters, hedgetrimmers, chainsaws and even mowers. Portable generators feeding power to hedgetrimmers is popular in many of the top topiary gardens in the UK, although many stick firm with their petrol fuelled machines, for reasons of power and portability. The items we trialled used a variety of dry batteries – from plug-in types identical to those found on cordless drills, to larger units that were attached to a range of backpacks. Naturally, the size of battery dictated usage time and charge time. What was interesting, was that memory was being built into the newest systems, which when plugged into an associated computer system, could provide information as to run times, attachments used, and importantly – if the unit had been overly stressed in any way. Information obtained directly from a battery unit in this way can be invaluable for service agents when dealing with genuine or fraudulent warranty claims for example. 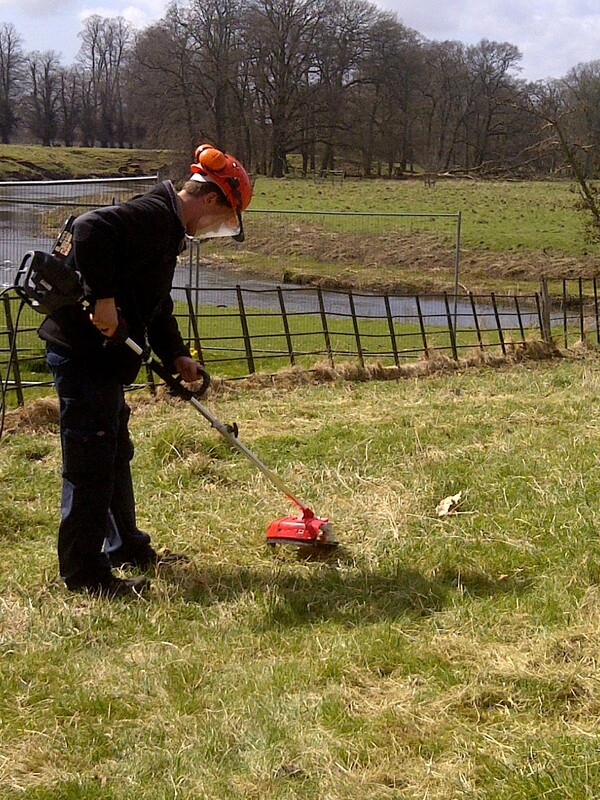 Paul Smith putting a strimmer to the test on the banks of the River Avon. I won’t feed back the pro’s and con’s of each machine, but will say that in trying the equipment back to back – it was clear to see that there is much difference between the many models and units available. All of the items we saw are currently available on the open market, but we also heard of new items in the pipeline – which helped to show us which manufacturers were seeking to improve and invest in the range of battery-powered machines on offer. I would say that overall, the units each had their own selling points, each sounding and looking useful when demonstrated. My concern over run times, or more simply – how long each item would last on a full charge; was vindicated. 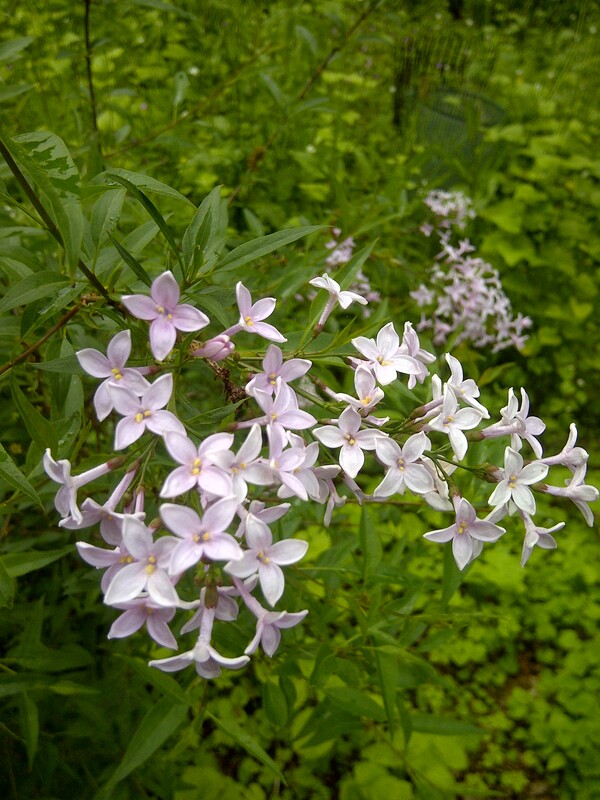 However, I could see that each item had been designed for a specific application, and many of the items we tried would be perfect or more appropriate for domestic or small-scale professional gardens – not full-sized landscape parks. There were items however, that did show much potential for use at a site such as Compton Verney. Adding weight to the machine produced a balanced and easier tool for use. In terms of selling battery-powered machines, I would say there are very real benefits to many users. 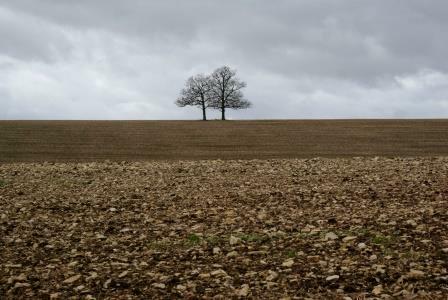 Quiet: Noise, or lack of noise, was a real improvement over petrol powered machinery, this itself can be a real problem in built up or sensitive areas. Weight: Often a downside to battery-powered items, this was improved with back pack units. Versatility: Although not just restricted to battery-powered items, this aspect is creeping in and very welcome. One power unit could be used to power hedge and lawn trimmers, extending chainsaws and leaf blowers etc. Batteries: Being available in a variety of forms, they now are easier and quicker to charge, but beware of run times, as some were as little as 30 minutes – not good for the average landscape garden, but perfect for the smaller scale hedge trimming. I could see there are real practical benefits in switching to the appropriate kit, and the day proved very useful as an introduction to battery-powered gardening. One thing that did shine out was the potential with some initial investment to charge batteries via solar panels; which does appear to be offering a real greener alternative. At this stage, a complete switch to battery power isn’t viable for us; petrol powered machinery winning the day. But considering the safety issues around collecting, storing and using liquid fuels, and also the unpredictable cost, battery seems to be the way ahead. I look forward to exploring the use of battery-powered garden tooling at Compton Verney, having been educated and reassured as to the pros and cons. I’d like to pass on our thanks to Charlecote Park staff and Horticulture Week for making us feel welcome, and for a fascinating day – very useful indeed! 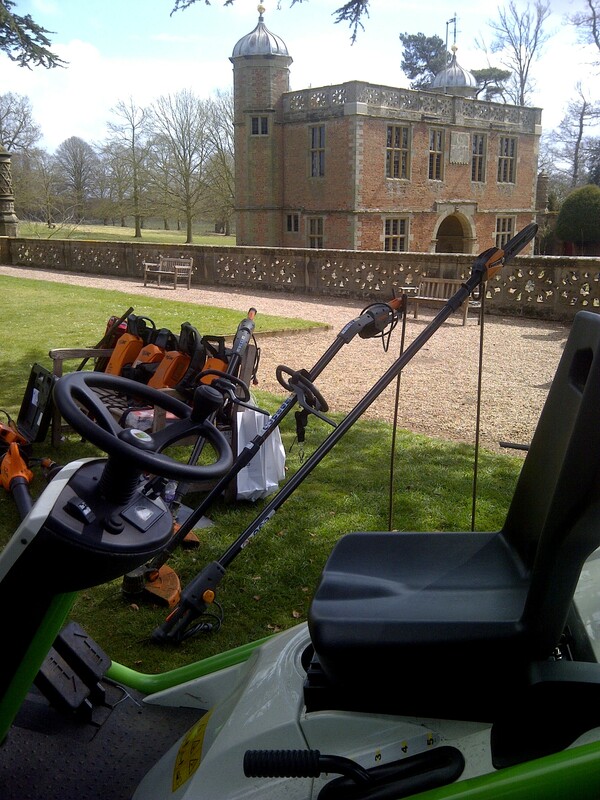 This entry was posted in Grounds Team updates and tagged Charlecote Park, Compton Verney Landscape and Gardens, Green Machines, Horticulture Week, National Trust, Solar Power on April 17, 2013 by Grounds Team. 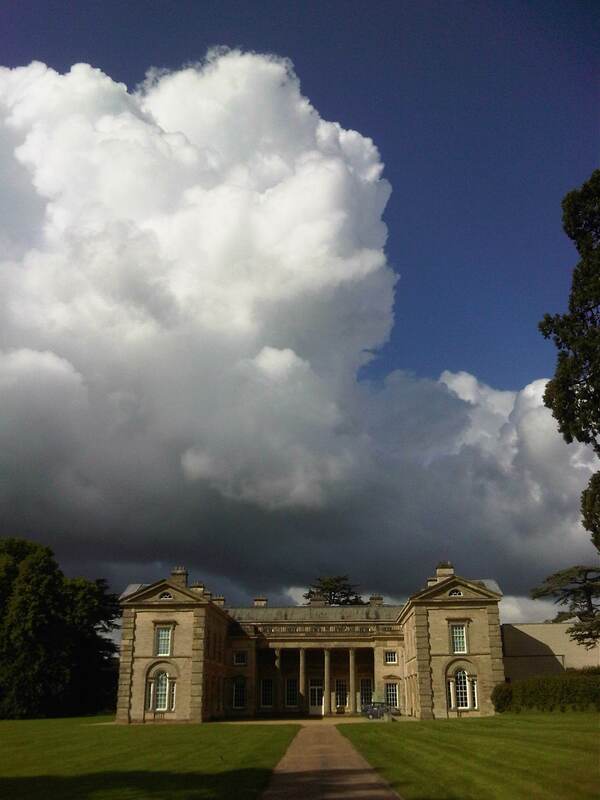 Welcome to the first post from our eagerly awaited Compton Verney Grounds Blog! 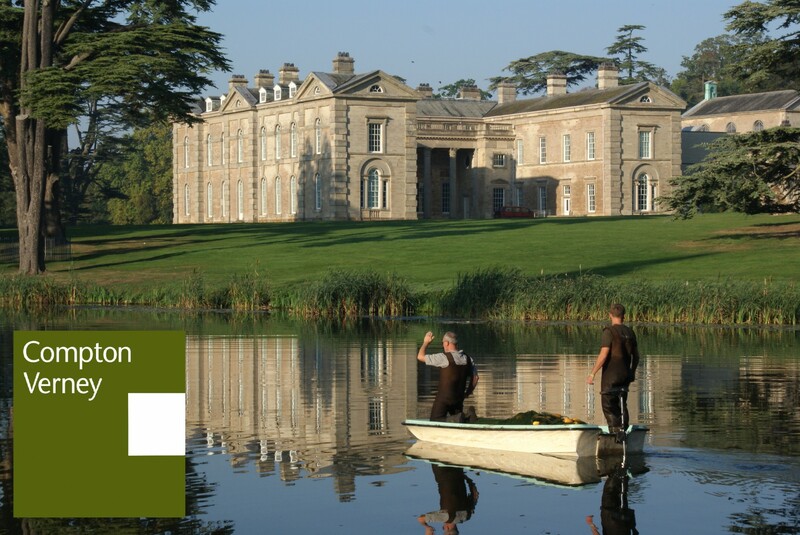 This blog is a new venture for the grounds team from spring 2013 and the main objective is to post information about the grade II* listed landscape and garden surrounding the art gallery – Compton Verney. We shall try to make each article accurate, informative and worthwhile, and will be looking to add approximately two posts per month. Having said this, other duties may need to take priority during busy periods, so please keep with us if we drift a little now and then! Posts will be assembled by grounds staff and volunteers on many aspects of the landscape and gardens at Compton Verney, including: planting, wildlife, bee keeping, landscape and garden history, and of course art in the grounds. If you wish to experience the greener side of Compton Verney, then please follow us, join in, and show your support for this precious Warwickshire location. 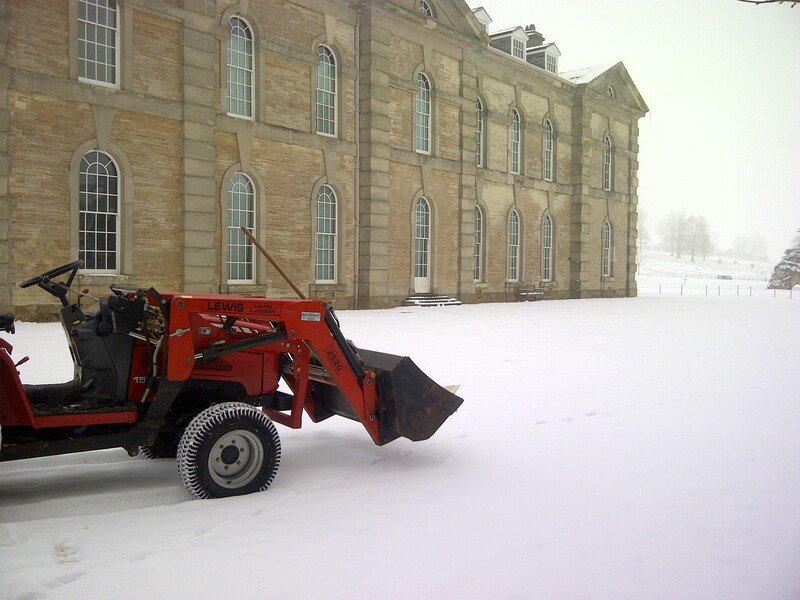 This entry was posted in Grounds Team updates and tagged #cvgrounds, Compton Verney, Compton Verney Grounds, Compton Verney Landscape and Gardens, Head of Landscape and Gardens on March 19, 2013 by Grounds Team.